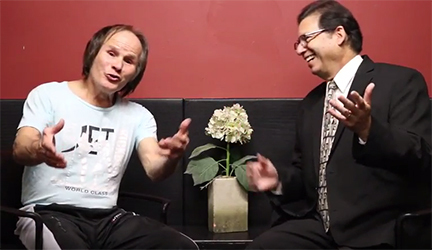 Burbank, CA – In an effort to bring new awareness to the Martial Arts History Museum, Benny “the jet” Urquidez, the greatest professional martial arts kickboxer of all time, conducts an impromptu interview with museum president Michael Matsuda to inspire others to offer their support to help grow the museum. Urquidez, who played a major role in pioneering full-contact karate, later called kickboxing, opened the doors of kickboxing to a new generation. Through his unique training methodology and his boxing background, he revolutionized the art and kept it alive for many decades. Today's mixed martial arts and the United Fighting Conference (UFC) owes their success to Urquidez's accomplishments. “I have been honored to know Benny Urquidez since I was little. He was part of our neighborhood. Being there to see him become one of greatest pioneers in martial arts history had a big effect on all of us. He was an inspiration to both the Latin community and proved that with hard work, anyone can make their dreams come true,” says Matsuda. Urquidez is not only one of the most popular figures in the martial arts community, but he is well-known throughout Hollywood's top stars. “Los Angeles Magazine” named him “Los Angeles Best Personal Trainer.” “The Jet” has trained Tom Cruise, Nicole Kidman, John Cusack, Nicolas Cage, Jean-Claude Van Damme, Jimmy Smits, Chuck Norris, Kurt Russell, Mark Wahberg, Louis Gossett Jr., Michelle Pfeiffer, Juliette Lewis, Michael Keaton, Woody Harrelson, Rene Russo, and Patrick Swayze. David Lee Roth, who trained with “The Jet” for years, has dedicated the Van Halen hit “Jump” to his teacher. The Martial Arts History Museum, the first and only one of its kind in the world, began as a traveling exhibit in 1999 and toured across the nation. In 2006, it opened in Santa Clarita, CA and relocated to the city of Burbank in 2011. This year the museum celebrates its 17th year. The museum is a non-profit 501(c)(3) organization and is fully supported by donations, visitations and memberships. The Martial Arts History Museum is located at 2319 W. Magnolia Blvd., Burbank, CA. (818) 478-1722. Website is www.Mamuseum.com.